Glacier National Park is spread out over 3 main regions, and there is so much to see that you’re going to want to pack as much adventure as possible into your trip! After visiting Yellowstone National Park, I wrote about my Top 10 Tips for Visiting based off all of our experiences. Since then so many people have wrote to tell me how much they enjoyed it, that I’m writing out my tips for each park we visit! I’m struggling a bit more to write out my tips for Glacier because I’m a local and it makes it harder to write from a visiting perspective, but I hope you’ll find this helpful. We’ve talked to so many people visiting in Glacier that we’ve met while hiking, and some of the same questions keep coming up over and over again. I know that whenever I’m visiting somewhere new, I get almost overwhelmed with the amount of options available, and it’s hard to figure out exactly what you want to do in your limited vacation days. I’ve been hiking and exploring Glacier National Park for over 15 years now, so I hope my list of tips below will help you to have the best trip possible! 1. The first thing you need to know about Glacier National Park is that the glaciers for which is was named, are on their way out. So many people come to Glacier and are disappointed that they can’t see massive glaciers right from the road. You can see a couple of glaciers while driving the Going to the Sun Road, but they’re definitely not as big as anything you’d see in Canada or Alaska. For the best glacier viewing experience I would try hiking Grinnell Glacier in the Many Glacier region of the park. The above and below photos are from that hike. 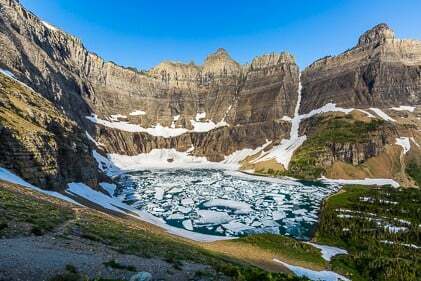 The trail climbs up to the remains of Grinnell Glacier, past the mesmerizing Grinnell Lake, (above photo) and finishes in a mountain cirque filled with the last of Grinnell Glacier and beautiful aqua colored glacial melt water, (photo below). 2. My next tip would be to know your basic itinerary because like I mentioned Glacier is spread out over 3 main regions. It really helps to know what hikes you want to do, and what region it’s in so that you can arrange your lodging. Having a basic plan also helps you make the most of your time because you don’t want to spend half of your vacation driving all over the park, (even though the views are stunning along the way). Glacier has also started a shuttle bus system that’s a really fantastic way to get around the park. Parking is very limited and you can even be turned away from entering the Logan’s Pass Visitor Center during peak hours of the day because the parking lot is too full. Glacier also has some great through hikes, and instead of needing a car at each end of the hike you can take the shuttle which is really awesome. As far as I know at this time the shuttle buses don’t go into the Many Glacier region of the park, but if you’re not planning on renting a car there are other taxi services that will pick you up on that side of the park, taking you back to St. Mary where you can hop back on the shuttle bus. 3. My third tip goes along with the second – figure out the top hikes you know you want to do and prioritize around those. All sorts of things come up on vacation, so it’s best to know which ones you really want to do when the weather throws you a curveball! I would definitely have different recommendations for which hikes to do depending on what region you’re in and how many miles you normally hike in a day. Overall my favorite hikes based off of amazing views would be Grinnell Glacier, Iceberg Lake, Ptarmigan Tunnel, and Cracker Lake. The Swiftcurrent Pass hike is also in the same area, and while it’s incredible I’m listing it last because it’s a long and strenuous hike, (these 5 are all in the Many Glacier region). On the west side of Glacier, the Hidden Lake hike starting from Logan’s Pass Visitor Center is top notch, and it’s short hike as well (although it’s very crowded). 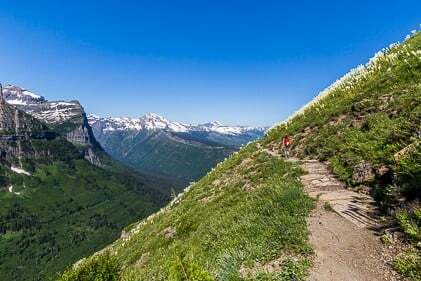 The Highline Trail is much longer but it’s also one of my all time favorite hikes for it’s amazing views throughout the whole hike, (I always recommend doing the Grinnell Glacier Overlook spur trail that’s part of the Highline if you are up for the extra mileage. The views are more than worth it because it looks down on Grinnell Glacier and into the Many Glacier valley). At the bottom of the Going to the Sun Road you can visit Avalanche Lake (5 miles roundtrip). Lake McDonald (the last picture in this post) is also worth a visit for the views. It’s a great place to end the day where you can go for a swim, have a picnic, or rent a paddleboard or canoe. 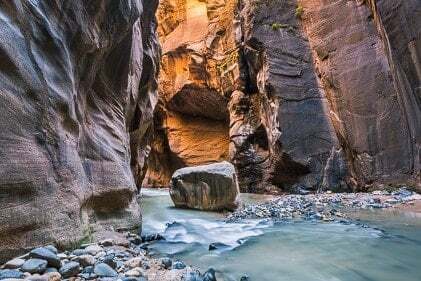 The St. Mary’s side also holds a few great hikes including Siyeh Pass, Piegan Pass, St. Mary and Virginia Falls, Sunrift Gorge, and Otokomi Lake. I’ve linked to each of the hikes that we’ve written about individually where you can read more about each one and see pictures. 4. What to do about lodging is also one of the most common questions, and we even met one couple in Yellowstone who were going to skip Glacier because they couldn’t reserve a campsite. Luckily, Glacier is just starting to implement a reservation system, and you can now reserve campsites at the St. Mary campground. All the other campgrounds are first come first serve, which I’ll have to admit can be an absolute headache sometimes. The best way to get a camp site is to arrive first thing in the morning when people are moving to another campground or headed back out of the park. By 10 am the camping sites have pretty much filled up, and you’re not likely to get a spot. The Apgar campground at Lake McDonald and the Avalanche campground seem to be the last to fill up, but depending on where you’re hiking these campgrounds can be a long ways from your trail head. For instance, Many Glacier is about 1 1/2 hours from the Apgar campground at Lake McDonald. It’s not that many miles, but the speeds are very slow on the Going to the Sun Road, and summertime traffic can double your driving time. If this doesn’t sound like fun to you, (and why would it?) there are KOA campgrounds just outside both the west side of the park and the St. Mary side of the park between St. Mary and Many Glacier. You can also book a room at any of the 3 main lodges. There’s one on Lake McDonald, one in St. Mary, and another one in Many Glacier, (with perhaps the best views). And just a quick note on the lodges, they are really gorgeous (with restaurants to eat at and gift shops) but they’ve been kept completely original which means no pools, hot tubs, and other such frills. This really burns some people who didn’t seem to realize they were staying in an old school environment! Some people like to stay in Whitefish which is a really quaint resort town with great restaurants to eat in. The only drawback to this is that Whitefish is about a 40 minute drive, (if there’s no construction) from the park entrance. Then there’s at least another hour after that to get up the Going to the Sun Road to Logan’s Pass, and yet another 1 1/2 hours to Many Glacier. Bearing the driving time in mind, it’s best to stay in or near the park to get the most out of your time there. 5. My fifth tip is to stay away from the wildlife, I can’t tell you how many times this comes up even in a single season! When you see an up close picture like the one above, it’s not because people are actually close to the wildlife. Many photographers have fantastic zoom lens that create the most beautiful wildlife photos, but it’s really unsafe to approach wildlife, and it can even be life threatening. Bears are an obvious example of animals to keep your distance from, but big horn sheep and goats can also harm you, and should be treated with the utmost respect. There are also wildcats and wolverines in the park, all of which should be avoided at all costs – no photo is worth your life! 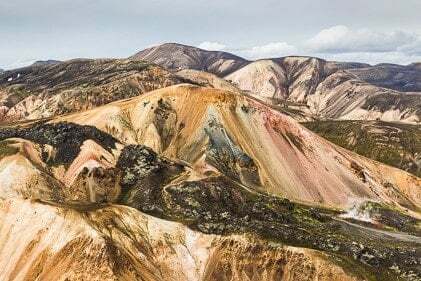 The day I took the above picture, and man with his wife and kids came charging up the trail because he had heard there were big horn sheep somewhere on the trail, and he wanted to get close for a photo. He asked me where they went, and I said they had just went charging by and off into the woods after being spooked by the traffic on the road. I mentioned to him that they can be really aggressive, especially when they’ve already been upset, and that it might be a good idea to keep a good distance away. He was completely surprised to learn that they could be dangerous, and thanked me for warning him and his family. Wildlife is just that – wild – and getting close is never a good idea! 6. Another common question is ‘when is wildflower season’? This one is hard to answer because it varies from year to year based off of snow pack in the mountains and the amount of rain we receive in the spring. But in general the wildflowers are usually at their peak in the 2nd and 3rd weeks of July. 7. And speaking of seasons, lets talk about the seasons of Glacier for the next tip. Glacier has a very short season in which the whole park is open. The Going to the Sun Road usually opens at the end of June, (at the very earliest) and it’s almost always open by the first week in July. The road closes to through use somewhere between the beginning and end of October. Even after the road closes you can usually still drive as far as Avalanche Lake through November on good years, and you can take the highway the long way around to access Two Medicine and Many Glacier. The website for Glacier National Park is great because they keep you up to date with road closures, campground status, and any kind of fire restrictions. The winter becomes even more limited with the Going to the Sun Road being closed at the Lake McDonald Lodge on the lake. The road into Two Medicine isn’t maintained in the winter so there is limited access there as well. Many Glacier is open (mostly for views, I don’t think any of the businesses are open) but it’s a long long way to get there if you’re staying on the west side of Glacier. I wrote a post about Wintertime in Glacier detailing a bit more if you’re interested. I would try to come in the summertime when you can see more, but if you do happen to be in the area during the wintertime, Glacier has a certain magic to it when it’s covered in snow, (and there more than enough activities to fill up your time). 8. Where to find food is of utmost importance when you’re out pounding the trails day after day – you’ll likely find your appetite sky rocketing after a couple days of this! There are restaurants and food options in the Lake McDonald area, the town of St. Mary which is just out side the park after you’ve driven the entire Going to the Sun Road, and there are places to eat in Many Glacier. As far as Two Medicine goes, the eating options are in East Glacier before you make the drive down into Two Medicine. It’s important to note that there are no restaurants at Logan’s Pass. The visitor center there has bathroom facilities as well as information, but no food. And speaking of facilities, finding a bathroom along the Going to the Sun Road isn’t too hard if you have more than one driver in the car. The parking lots are often filled up through the mid-day hours, and if you’re driving by yourself you might just have to wait through the whole drive before you can stop. This has happened to me on a number of occasions, so it’s best to plan ahead! If you have someone with you, they can double park and stay with the vehicle if you need to stop. 9. There are all kinds of recreation available in the park. You can take a tour in the famous red buses with open tops, and see the entire Going to the Sun Road. There’s paddleboard/canoe rentals at Lake McDonald like I mentioned, and there’s horseback trail rides available at both Lake McDonald and Many Glacier. Park rangers lead guided hikes on certain trails at certain times, so you can check with the visitors center to see which one might interest you. You can also ride your bike through the entire Going to the Sun Road, but there are time restrictions with this, so be sure to check with the rangers for more info. 10. My final tip is to relax and go with the flow, a vacation rarely goes off as planned but it’s always a blast anyways! Traffic can be bad, weather refuses to cooperate, and sometimes injuries happen that can put a damper on the amount of miles you planned to hike. 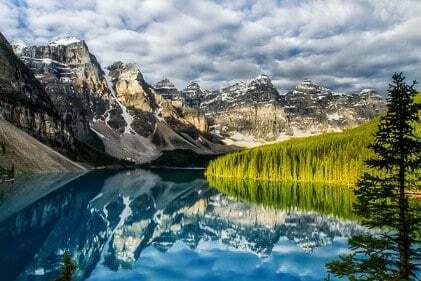 No matter what happens, you’re going to see some of the best views of your life, and hike in the ‘Last Best Place’. Simply let the Montana magic happen! I was also thinking to combine with YellowStone NP, as guessed my next stop is your blog on that. meanwhile any recommendation on 5-6 days backpack route. So glad you’re enjoying the post! I couldn’t tell you how many days to plan since that would completely depend on how many miles you drive per day from DC and how many stops you’d like to make. Since I’ve never traveled that way before I don’t know what to advise. You’ll definitely want at least 3 days in Yellowstone to see most of it, and a week in Glacier is nice to get a feel for the different regions of the park. I haven’t backpacked in Glacier, rather doing day hikes, but I do know many who have loved backpacking in the Belly River area as well as the Highline Trail which runs from Logan’s Pass all the way into Waterton Lakes National Park in Canada, (you’d need a passport of course for that one). I’ve also found Google Maps to be very helpful whenever we plan a road trip to get a good idea how long it will take in between stops once you figure out where you might want to be stopping along the way. I hope this helps, and have a wonderful trip! This had been a Bucket List item for me – to drive from one end to the other of the Going-To-The-Sun road. Bring a camera and lots of patience if you visit in the summer. We didn’t take the shuttle buses; and there were places where the parking spots for a scenic viewpoint were filled. Also heed the vehicle size limits – this is a narrow road with rock walls on one side and a steep dropoff on the other. But the views are stupendous!! Agree, bring lots and lots of patience if you come in the summer months! Hey Kari, nice advice for Glacier visitors! I’m a local also. Have you ever taken a bicycle up Going-to-the-Sun before the road opens to vehicles? In April/May you can ride from Lake McDonald Lodge, prior to the road opening to Avalanche parking in May/June. Of course the parking is getting crazier every year because the word is getting out about cycling the road during the early season, but shuttles run with bicycle trailers able to shuttle 20 bicycles. You really get a sense of the road that you would never otherwise experience by using the bicycle. Yes I’ve been part way up bicycling before, but haven’t made it to the top yet! It’s a really nice way to experience the park early in the season, and I agree it is getting crazier every year with how busy it is even in the off seasons. Hi Kari, I’m visiting Glacier the first week of Sept — will only have 3 days in the park and am trying to plan my itinerary for hikes. I checked out your pics from the Many Glacier Area of the park and it looks amazing! I’m staying in West Glacier. Is it reasonable to plan for those hikes given where we are staying? And would you recommend taking the bus or driving? Thanks in advance for any tips! It’s definitely feasible to plan for some hikes in Many Glacier, I would just recommend leaving very early in the morning to avoid the crowds on Going to the Sun if it’s opened up again, and so that you get a parking space when you get there. If Going to the Sun hasn’t reopened, the drive around will take longer, but it’s still doable, and I would recommend driving. As far as I know, the shuttle bus system doesn’t go to Many Glacier, but you could check their website just to be sure. With the crowds this year, people are often having to wait hours for the next shuttle bus so that’s been a challenge as well. Great read. I’m from WV and I’m planning a massive cross country road trip with Glacier NP as one of my stops. I’ve never been out west or up north so I can’t wait. Thanks for getting me even more excited. Wow, I sure hope you have an awesome trip! @Zack, have you already completed this road trip or planning in near future? I was thinking same in early-mid sept this year. I live in Northern VA, near DC and was planning to combine it with Yellowstone NP as well. any tips would be highly appreciated. Hi Kari. Your site is SO helpful! I’m going on a solo trip August 15-22, with a rental car. Open to camping some, but (1) concerned about how full the campsites are that allow reservations (I don’t have any), and about what happens if I hang around a non-reservation campsite in the morning and don’t get a spot – do you think it’s usually easy to do that with success? And (2) what I like best is shorter hikes (from the car) without a lot of people around. Any specific guidance? Finally, (3) I’m wondering about basing myself in an Airbnb place in or near Kalispell for a few days, and doing day trips, to get oriented, before heading off early morning to Two Medicine campground – any thoughts on that idea, and places to explore near Kalispell? Sorry I’m getting back to you a little late, but hopefully you’ll be able to find camping just outside the park if you don’t have reservations. You can hang around in the morning and most times land a spot, but the park gets busier every year, so there’s always a few campgrounds outside the park as well. Normally basing out of Kalispell would be a great idea, but since the west side is shut down with forest fires, it’s a long drive to Two Medicine and Many Glacier from Kalispell, so it might be better to camp somewhere closer. If you are hanging around Kalispell, Flathead Lake is beautiful, and Whitefish Mountain is a fun place to take the chairlift up and down. However everything is blanketed in smoke across the Pacific Northwest, so views are very limited, (as you’d know being here already). I don’t know of any short hikes with less people unfortunately, the short ones are usually the most crowded. I sure hope you’re able to enjoy yourself a little while you’re here despite the terrible conditions! Thank you for the very informative post about visiting Glacier National Park. My team of four is preparing for a nine day visit in August with reservations to hike Garden Wall to a night at Granite Park Chalet, then down Swiftcurrent Pass to a day and night at Many Glacier campground. Then we shuttle to a trailhead for a three day and three night backcountry hike along Gunsight Pass, Then two days in the Lake McDonald area before a final overnight hike to Otokomi Lake before our last night at St. Mary’s lodge and the drive to the airport. We are looking to depend heavily on the shuttle system once we are in the park. Any recommendations about shuttle service? We read there is an early morning shuttle for hikers from Apgar to Logan Pass. Any advice about developing a Plan B in the case that there are trail closures due to bear activity or weather or fire threats? It sounds like you’re going to have a fabulous trip! My only recommendation with the shuttle is to try and get the earliest ones possible to get started with your day, they do tend to get busy as the day goes on. A friend and I hike the Garden Wall, popped up to the Grinnell Glacier Overlook then hiked to Granite Chalet and down the loop. At the end of such a long day we thought we’d be able to get a shuttle back up to Logan’s Pass, but everything was jammed. After about 30 minutes of standing in the heat, we managed to hitch hike a ride in the back of a truck to the top. So hopefully you’ll have better luck with the shuttles, as hitch hiking with a group of 9 would be tough, (and just to be clear I’m not recommending it for safety reasons!). I’ve never had trouble in the early mornings getting a shuttle ride, but the afternoons have been hit or miss over the last few years. Just be prepared to wait it out if necessary. I wouldn’t be able to give advice based on fire threats because they could threaten any part of the park, but the trails you’re planning on hiking don’t typically have bear closures, so you should be good. Otokomi is fantastic, and so much less traveled then many other trails. If you do need a plan B anything in Many Glacier is great, Ptarmigan Tunnel, Iceberg Lake, Cracker Lake, and Grinnell Glacier. I don’t know if the shuttles go into Many Glacier yet though, but I’m including the link to the park’s shuttle page. Outside of Many Glacier, Siyey Pass is great if you have a trail closure, it’s not too far from Otokomi. I can’t think of anything else unless you had a car to go to some of the remote parts because you’ve already planned out most of the best hikes. I sure hope you have a great trip! Awesome post! We really love Glacier and your comments are so spot on. Tip #3 is the best as the hikes are the highlight of any trip to Glacier. Plan hikes first then everything else around them! Thanks so much, I really appreciate it, and it’s always nice to hear from a fellow Glacier enthusiast! I’m having difficulty in figuring out what glaciers we might be able to see in early to mid June. (We can manage moderate hiking, but not extended strenuous hiking). I haven’t been able to tell if Grinnell is accessible, or even if we could manage it. Are there any other options to hike or drive to a glacier view so early in the season? I am intrigued with the Two Medicine area, especially since Going to the Sun will not be an option. We’d appreciate any information – Thanks! Grinnell may or may not be open, but with the crazy amount of snow we’ve had, I’d have to say probably not. It’s considered a moderately strenuous hike as well. Sometimes early in the season, you can hike the trail as far as getting a view overlooking Grinnell Lake but after that the trail is sometimes blocked with snow. Depending on how much of the Going to the Sun Road that might be open, you may be able to drive in from the St Mary side up to Jackson Glacier Overlook. I can’t think of anywhere else you can see glaciers from the road, but there may be something I’m not aware of. I haven’t done much in Two Medicine, but I really want to hike more of that area. Scenic Point might be available to hike by mid-June and it’s a moderate hike in Two Medicine. If you happen to have lots of time on your hands and want to see glaciers from the road, I’d recommend the Icefields Parkway road in Canada, just north of Banff National Park. From Kalispell, it would probably be an 8-10 hour drive to get there, but it’s non-stop glacier views that are jaw-dropping right from the road. I’ll leave you some links to my posts about it. I hope this helps, and I’m sorry I don’t know more right now, but with the snow pack situation this year, it’s hard to tell what might be available so early! Wow this is fantastic! 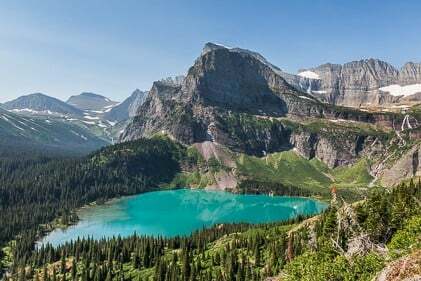 I will be in Glacier for 4 days in July on a solo trip. Do you know of any organized hikes? I don’t know of any organized hikes, but I think the rangers do some very small led hikes, possibly to Avalanche Lake. Another one that’s good to do by yourself is Hidden Lake because it’s quite busy and it’s easy to always be around other people. You might check out their website as well to see if there’s anymore guided hikes, (I’ve included the link below). What a great post! I really enjoyed reading everything. We are going at the end of August this year. You really helped me with our itinerary since I’m in charge and have never been before. We are staying in Whitefish….so my question is, how far is Whitefish from Many Glacier? 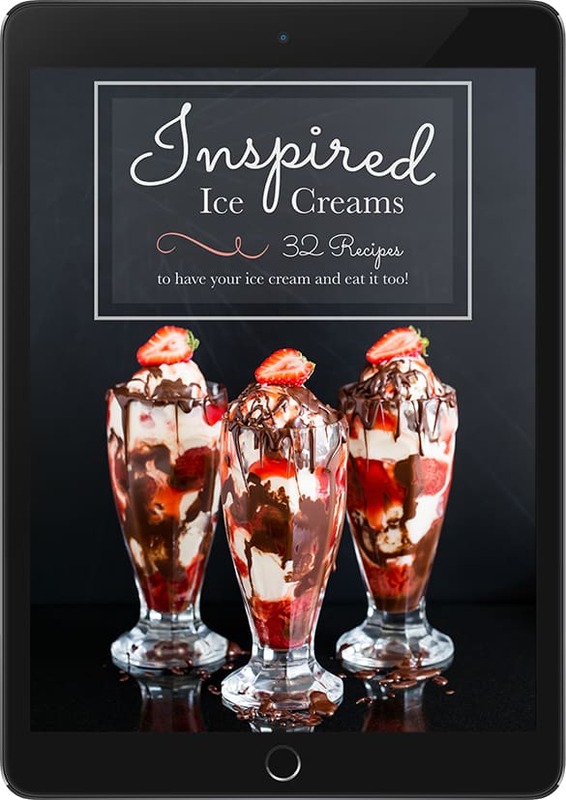 I’m so glad to hear you’ve been enjoying the blog and found it helpful! On average to get from Whitefish to Many Glacier I’d budget 3-4 hours to get there. You might be there quicker, depending on the time of day, and whether or not there will be construction along the way. There are so many variables, and the later in the morning or afternoon you leave Whitefish, the longer it tends to take. Last year, we actually left our house in Kalispell, (a similar distance as Whitefish) at 2:00am in the morning because we wanted to get sunrise photos in Many Glacier. It still took almost 2 1/2 hours to get there, and there was absolutely no waiting or traffic involved at that hour. I hope this helps, and I’m sorry I can’t give you an exact time, but like I said there’s so many variables during our tourist season. If you can, I’d recommend driving over early, early in the morning, or in the evening after 7pm or so. Great blog! I’ve been visiting family in Kalispell since I was a child. I am bringing a group of college kids to West Glacier in mid-August. They want to take the trail to Hidden Lake from Logan’s Pass. I’m setting aside about 6 hours for the trip up and back. I was planning to head up from Whitefish EARLY in the morning to avoid crowds. I’ve never driven Going to the Sun at 4:00am before so I’m a little nervous. Do you think that is enough time? GNP is a lot more crowded than the old days and it’s been awhile since I’ve done this trip. Thanks for any advice. I would budget more like 8 hours to be on the safe side if you’re talking starting time from Whitefish. It can take 2 1/2 hours one way from Whitefish even without traffic early in the morning. I think you’re on the right track to start early though, the parking lot usually fills by 8:30-9:00am. As far as being nervous about the drive, I’ve personally found it easier to navigate very early in the morning when there’s less people on the road, so hopefully that will be the case for you too. Also with a group, everything takes longer from getting all geared up to any types of breaks and stops, so I think you could do it in 6 hours, but 8 would be more comfortable. I hope this helps, and be sure to let me know if you have anymore questions! Thank you for the post! We’re going June 9-16th, 2018. Will the Going-to-the-Sun road be open by then? If not, what do you recommend to see and do that WILL be open? Have you taken the Empire Builder train from West to East Glacier? What about a good spot to see the night sky? Do you have recommendations for things outside of of GNP, but not too far away (like within a couple hours of driving)? Thanks for any advice! There is very little chance the Going to the Sun Road would be open then, it usually doesn’t open before July. As far as what trails might be available when you come, that will depend on how fast our snow pack melts, which varies every year. Depending on how many miles you’re up for, I’d recommend doing Avalanche Lake on the west side. Normally I’d recommend Sperry Chalet as a great hike, but I doubt it would be ready since the fires in that area were so bad last year. Also any of those types of hikes that lead into the high country could still be in the snow depending on the temperatures we get this spring. Scenic Point in the Two Medicine area might also be a good one, and it would be on the way driving from the west side of the park to the east side, then comes Two Medicine and if you keep going all the way around, you’ll come to Many Glacier. Cracker Lake in Many Glacier is sometimes ready to hike by the time you’re coming, and possibly Iceberg Lake and Grinnell Glacier trails as well. I’ve never taken the train from west to east glacier so I couldn’t say, but I’ve heard other people have had fun. Normally I’d recommend going to see Waterton Lakes National Park just across the border in Canada if you’re going as far as Many Glacier because it’s only maybe another 1.5 hours, but they had some serious fires too last year, and they’re talking right now about shutting it down altogether to do some repairs, so you’d need to check online to see if it’s even worth it closer to when you’re coming. Other things that are fun to do in the area are visiting the Hungry Horse Dam/Reservoir. You can camp in the campgrounds and there’s a small amount of hiking, (not spectacular) but the camping views are great. You might also consider the Jewell Basin area if you’re looking to get off the beaten track and away from the crowds of Glacier. Another thing a lot of people like to do, is to hike up Big Mountain now know as Whitefish Mountain and take the chairlift down. I’m pretty sure they just put in a cafe at the summit house that I heard is now open in the summer months, so it can be fun to hang out with the views overlooking Whitefish Lake and into Glacier Park from the top. I hope this helps and be sure to let me know if you have anymore questions! Nice tips :). I’m looking on going next September with my Wife who doesn’t hike all that much but is massively keen on visiting the park. Would you say that a very high fitness level is needed? I understand that there will be alternative options but would you say most of the high elevation trails are strenuous or are the paths well maintained and gradual? Thanks for the very detailed post. I’m going in a few days, and this edited my itenerary quite a bit. I’m so glad to hear you found it helpful, and I hope you have the best trip! This is a very informative post, coming from a local, and being asked the same questions too. Good job and as usual awesome pictures. Thank you, and it’s good to know that you’re hearing all the same questions as well! I’ll be there in a few days,! I hope you have a great time, the weather can be really unpredictable this time of year but there are always other activities to keep you busy in between storms! Great post, Kari! I wish I’d seen this before I went to Glacier. I guess I’ll just have to go back soon! We did canoe on Two Medicine Lake while we were there, which was really fun–there was a bear romping along the shore that was fun to watch, and the reflections of the mountains in the lake were so pretty. I love watching the wildlife from afar too, and I can’t wait to explore Two Medicine a little more this year! I hope you get to plan another visit sometime because there is so much to see, be sure to let me know when you’re coming – it would be fun to meet up!